Knitting on the iPad, Part II (also, knit some squares!) | Knit Like You Mean It. The iPad and your knitting: a match made in tech heaven. Plus, in the foreground is some yarn we're giving away! It’s been more than six months since Mr. Trask presented me with my glorious iPad as a birthday gift. In that time, I’ve taken the iPad to England, used it to read patterns and draft essays, and generally made it my new best friend. I’d say it took me a good month to figure out how to make the iPad work for me: what it does best, what I need it to do, what I need to leave to other devices. Meanwhile, the knitting world is edging, ever-so-slowly, into the iPad arena. Given all this, it’s time for an update about Knitting on the iPad. UK Knitting Magazine The Knitter is available on the iPad magazine reader Zinio. You can subscribe and buy back issues. I’m trying my hardest not to buy every back issue there ever was. Zinio uses images of each beautiful page of this magazine, so you don’t miss any of the content (but occasionally have to zoom in to read). Since The Knitter is already a beautifully designed magazine, it translates well to the iPad. The Knitting Daily iPod app. It’ll work with the iPad – the app will just use an iPod-sized amount of space on your pretty tablet. You can zoom in on that space, althoughit looks a little blurry. That said, the app has articles, videos, all kinds of cool information – it’s a must. More knitting books are coming out through Amazon’s Kindle e-reader software (which has a free iPad app). Stephanie Pearl-McPhee’s excellent reference book Knitting Rules! should be your first purchase. Using an e-reader on iPad has enabled me to read and knit at the same time (for me, the Holy Grail). For now, the best way I’ve found to read patterns on the iPad is to buy pattern PDFs, and either save them to my MobileMe iDisk or add them to the iPad app Readdle Docs. Then I just prop the iPad up with the pattern open. I can’t take notes on the patterns, but this is still a great option, especially when traveling. 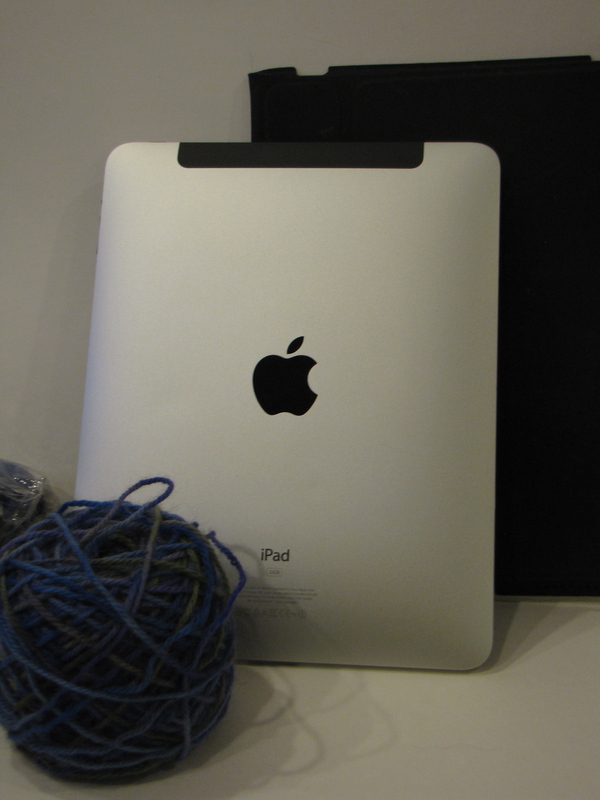 Knitting iPad owners, what have you found that you can’t live without? 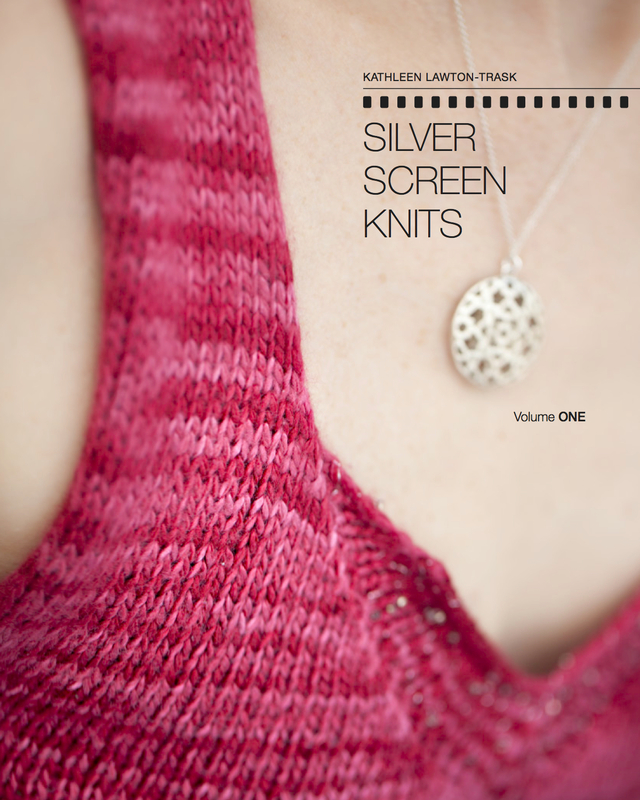 Anyone out there using a Kindle or a Nook to read patterns or knitting books? Fill us in on your knitting 2.0! And now…the latest giveaway. Garter Stitch 100 is still looking for knit squares, and the deadline is March 1, not Feb. 1 as I reported earlier. So get them squares knit, and for your troubles I’ll give you an extra entry you to win four (4) skeins of Jamie Possum yarn, purchased at I Knit London last July. The yarn is wool and possum fur, very soft, with a bit of a halo and lovely hand-painted colors. One skein has been wound and three are still in their packaging. It’s just dying to come home with you. So, to recap: comment on the blog before Feb. 3 at noon, get a chance to win the yarn. Knit a square and send me a photo of the square (or send me the square), and get TWO chances to win the yarn. A chance per square. Any questions? my vow this year is to greatly reduce my stash – but there’s nothing about winning yarn, especially yummy sounding yarn! thanks for the op to win! I ventured out to buy my 2″ notebook for my TKGA Level I Hand Knitting project. Apparently possum yarn is right out as far as the master knitter judges are concerned but I would still like to win some. It sounds warm and I could use some warm right about now. BTW, my notebook is a very neato aqua blue, I hope that meets with the approval of the judges. Now the hard part, reading the instructions for the swatches! Hi Kathleen! Quick comments on the whole PDF thing. 2. The best PDF reader I’ve found is iAnnotate. It allows you to take notes on the PDF, and it will let you store files in Dropbox. There are several annotation apps now – another good one (ie in which the handwriting is well done) is Noteshelf, but for that one you’d have to take a screenshot of the pattern and add it to your note, because it won’t open a PDF. 3. Finally, if you put the files into Evernote, they’ll be searchable – even the annotations. And Evernote is free unless you upload whopping amounts per month. I use the GoodReader app on my iPad. $1.99 and worth tons more than that! You can then add any PDF from your computer to your iPad. I put my current pattern I’m working on the iPad. You can add notes and highlight any PDF with this marvelous little app. I haven’t bothered with notes but I have highlighted the stitch counts for the size I’m making. It was a little awkward at first until I figured out that you should enlarge the area you want to highlight first (with the thumb and index finger swipe movement) and then highlight the text by pressing and dragging to highlight. Works perfectly!!) One pattern I was working on from a book, I scanned, made it a PDF and then put it on my iPad. But every other pattern has been a PDF I downloaded. I WANT AN IPAD SO MUCH I CAN HARDLY STAND IT. Kathleen, thank you so much for your kind words and the link to Knitting is Gluten Free. Good grief, I really need to get on the ball and post another one — way behind here. I’m so excited about winning! I’ve never won a blog post or podcast thing, although I never post for the prize . . . I post because the blog or the podcast IS a prize, as yours always is. Sigh. Sometimes it works, sometimes it doesn’t. Possum yarn? I gotta ready more about that.